Jane's Turning 85: Will You Be a Part of Generation Jane? You are at:Home»Seriously Good For All»Jane’s Turning 85: Will You Be a Part of Generation Jane? 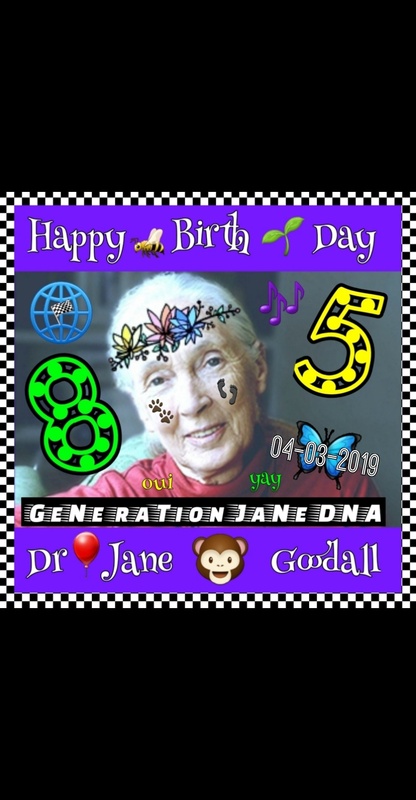 On April 3rd, 2019, we celebrate the 85th birthday of Dr. Jane Goodall, a woman who for nearly 60 years has inspired and motivated millions of people around the globe to live in greater harmony with nature and to create a more just and peaceful world. On this special occasion, we recognize the unique legacy of Dr. Goodall’s scientific breakthroughs and courageous leadership which has led to positive changes in policies and attitudes, benefitting animals, humankind and the natural world. Compelled by Dr. Goodall’s mission to live sustainably and with compassion, we look to the future with new hope. For Jane’s 85th birthday, in the spirit of her vision, join us in building a cross-generational movement of people who resolve to make the planet we share a better place for all. 85 Years, Millions Inspired, One of a Kind. For Dr. Goodall’s 85th birthday on April 3rd, 2019, we’re asking each of you to join us in realizing Jane’s vision for a better world for all. At a time when wildlife, ecosystems, and human communities are suffering, Jane still has hope for a brighter future and a belief that, together, we can create positive change for all. Jane’s vision is of a new age of harmony between animals, humankind and the natural world. To celebrate and honor Dr. Goodall on her 85th birthday, you can help make Jane’s vision for a better world a reality by joining Generation Jane. As a part of Generation Jane, each of you are agents of change, making sustainable and compassionate decisions in your daily lives, as parts of your local or larger communities, and demanding such action of corporations and governments alike. Together, we can lead a movement to save species, improve lives, and protect the natural world for generations to come. Share that you’re a part of #GenerationJane on Facebook here and Twitter here. Tell us in your posts what you’re committing to do to make the world a better place tagging #GenerationJane @janegoodallinst for a chance to be featured! Deforestation, the Sixth Great Extinction, climate change, human suffering – this is the face of the next 85 years if we do not act right now. But as Jane says, there is still a small window of time. Preventing loss of forests and supporting sustainable restoration alone could contribute to one-third of total climate change mitigation required by 2030. Chimpanzees, other ape and wildlife populations can recover and thrive, and we can be the reason. The resilience of nature is real, and we can and must heal the harm. JGI is creating that better world, and you are a vital piece of our puzzle. Sustainable livelihoods, best in class sanctuary care, girl’s scholarships, Roots & Shoots mini-grants, public awareness campaigns and habitat viability modeling are just a few examples of the ways in which we’re taking a stand for great apes, local communities and young people around the world. How? Providing training, funding, and supplies for projects like agroforestry and beekeeping gives local communities living near chimpanzee habitat sustainable options, improving economic mobility and reducing pressures like illegal logging and poaching. While we protect forests, we’re also working to reduce threats like the illegal pet and bushmeat trade through working with local law enforcement, establishing expansive education programs, informative billboards, and providing a world class sanctuary for rescued chimpanzees. We’re also investing in girls because we believe in girls, giving young women the education to shape their communities sustainably. When we support and collaborate with people to improve well-being, we can all work together to live harmoniously with the natural world. And it’s working. We’ve got so much more to do, and so much we’ve already begun… From providing even more girls with an education, growing our Roots & Shoots youth program to include 50,000 online members, protecting thousands of hectares of habitat across the chimpanzee range, sharing our Sanctuary Welfare Index to improve ape captive care all over the world, establishing conservation action plans across 10 African countries, and using our platform to encourage global audiences to be advocates for national and regional policies that create positive change – THIS is the face of the next 85 years…if you join us.